CONNECT is a student missions event designed to give students and their leaders the experience of a weeklong mission trip packaged into a single weekend. Participants are encouraged to connect with God through worship and personal Bible study. They are given opportunities to connect with other believers through fellowship and serving together. Most importantly, they are challenged to connect with unbelievers and to engage them with the Gospel to help connect them to the Savior. Students voluntarily give up a weekend and pay $25 and sleep on the floor just for the chance to show God’s love by serving others and telling them about Jesus. Each year, the Missions Team of the Arkansas Baptist State Convention partners with churches and associations to help Connect participants serve area residents through various ministry and service projects. In April of this year, First Baptist Church of Harrison served as the host for 179 adult and student participants. Working alongside other volunteers, pastors and church leaders, Connect students completed 14 projects in Harrison and the surrounding area. The combined efforts resulted in 12 salvation decisions. 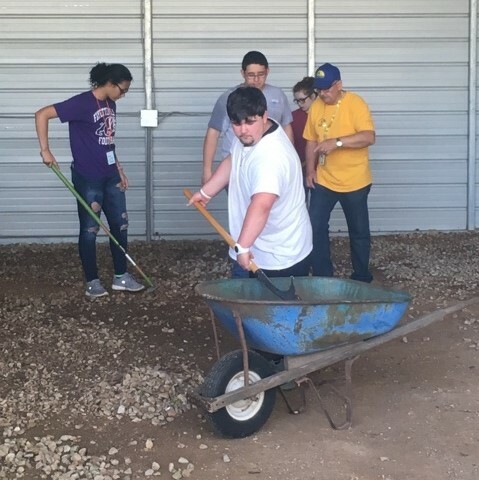 Projects included prayer walking, door-to-door evangelism, yard work, light construction, block parties and assisting the North Arkansas Association Disaster Relief (DR) team with clean up at their facility. Local churches provided the projects and the lunches on Saturday. The DR team from First Baptist Church of Ozark provided the shower unit while the feeding unit from the North Arkansas Association Disaster Relief Team provided breakfast and supper on Saturday. Brad Branham and a worship team from the Arkansas Tech BCM served as the speaker and worship leaders for the weekend. CONNECT offers an inexpensive opportunity for Arkansas Baptist students to engage in missions and ministry. Through participation in CONNECT students learn how to share the Gospel as they meet the physical needs of the people around them. They come to realize that many of the ministries that take place at CONNECT can be done back home in their own communities. In addition, students are introduced to Disaster Relief, Dixie Jackson Arkansas Missions, the Cooperative Program and various other ministries provided through the Arkansas Baptist State Convention. If you have never experienced a CONNECT weekend before, it’s not too late to get your group signed up for our final event of 2017. On October 20-22 we will be at First Baptist Church of Jonesboro. Go to www.absc.org/connect for information and to register. Contact Travis McCormick at tmccormick@absc.org if you have questions or for more information. CONNECT is a ministry of the Cooperative Program and the Arkansas Baptist State Convention.